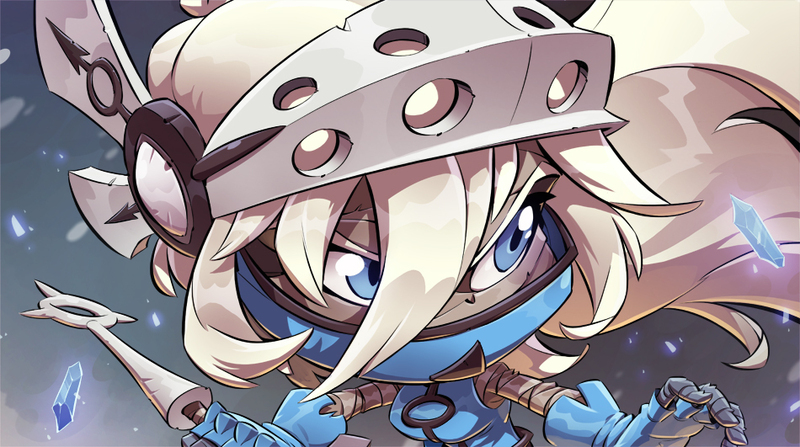 A Brawl of Ice and Fire - FORUM KROSMASTER : Forum dedicated to discussions about Krosmaster. Share all your opinions, ideas and tactical tips! 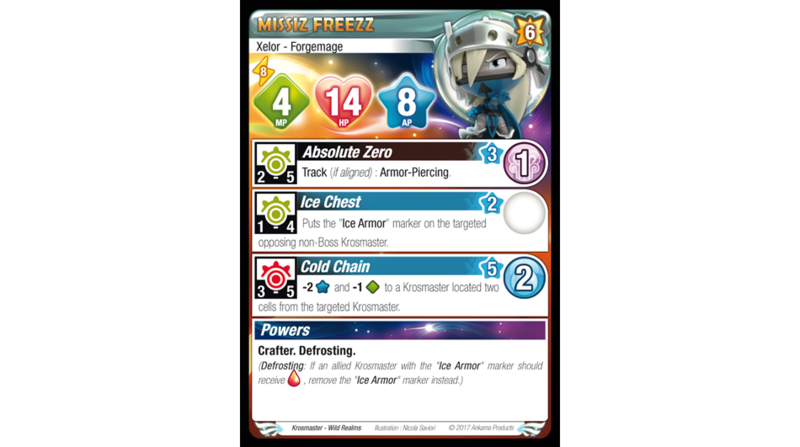 Missiz Freezz, because that's the one we're talking about, was originally created to confront Merkator in the first Duel Pack. However, she was ultimately replaced by Captain Amakna in the final pack, in order to better highlight the "Vigilante" theme prevailing in the Krosmoz. After a long wait, Missiz Freezz is finding her place in the collection. Her original model hasn't changed (it started out a success! ), but her game abilities have been changed quite a bit, and… You're looking at the card already, aren't you? Why am I boring you with details like that? Go on, there she is! Playing a different way than most level 6 characters, Missiz Freezz knows how to reward the more tactical players among you. What's more, she's the first Krosmaster that can place a marker on an ally… and what a marker! An Icy Armor like you'd only get from the best Smithmagi! It's not every day that a figurine of Freezz's calibre sees the light of day, so we've decided to double down! 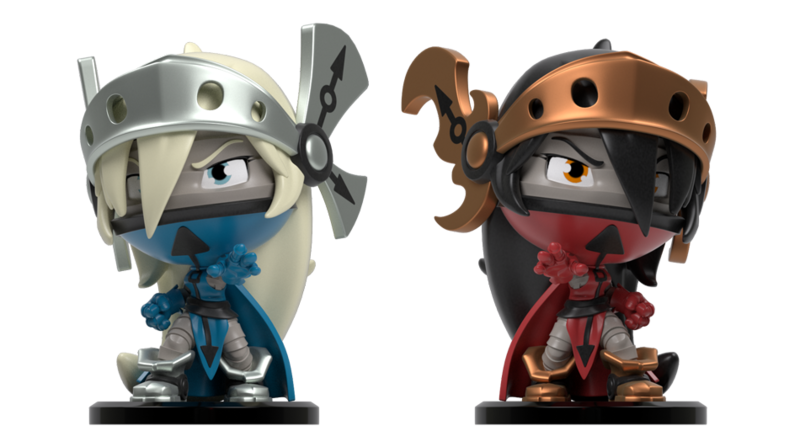 So a special version of Missiz Freezz will be available as a promotional figurine. She even has an unprecedented name and profile, which has never appeared in any Ankama games! 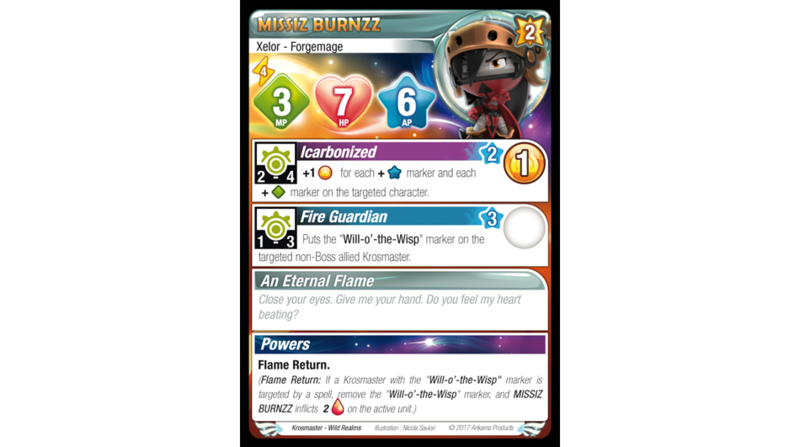 Allow us to introduce… Missiz Burnzz! Freezz is a fine tactician, and Burnzz is a dangerous attacker. She also has her own marker that covers an ally in armor, but the effects couldn't be more different! With these two different versions of Missiz available, it's up to you to breath ice and fire across the game boards! Now you know all of the profiles in Wild Realms… Tell us what you like, and what makes you can't stand! See you soon with more info. Actually, they should both say "allied", I'm sharing this back to the team. Freezz text should say allied and Burnzz text opposing. There are typos there I think. The Defrosting ability: does this mean when you're hit by an attack dealing 2 damage, you will receive only 1 damage or no damage? No damage. Instead of taking any kind of damage, you remove the Ice Armor token instead. Can Cold Chain affect a Krosmaster figure that is 1 cell from target? Wow I have no other words. These guys are great! Dewitt, the mention of the first Dual pack got me to thinkin about the 3rd dual pack. So has there been any progress/word on Anthar and Justice? I am so looking forward to those two, and haven't heard a thing about their situation in over a year now. Can you give any kind of update? Is it hopeless or is there still hope of seeing them? The Duel Pack 3 has been put on indefinite hold. There's no release date set for it, and I'm not sure there will be. Can I use Fire guardian (one at turn) on multiple ally? For example at turn 3 having 3 krosmaster with Will o' the wisp? same for the Ice Armor? According to the rules, Krosmaster putting special markers on others can only have one of them in game at the same time. So you may target different people over the turns, but the marker will simply move around, not duplicate. Therefore, there is only one Ice Armor and/or Will o' the wisp marker in-game at the same time (unless your opponent is also playing on of the Missiz). Dewit you said "Wild Realms has revealed all its secrets" except it hasn't at least not on the English forums. Unless I missed it you guys never revealed the rest of the wild realms, you basically revealed the first wolfs and orcs and then stopped. You DID however reveal everything on the French forums. But not here so far as I can tell. Please link if I am wrong. All the cards were put on the Facebook page, in all languages available. Feel free to have a look. PS- English forums STILL cannot make new posts. You said you were going to have that looked into. How about you actually do that? I have re-opend posting rights for everyone recently. Try unlog and re-log from the forums. guys, they're done pushing this game outside of France, can't you get it? Do you really need any more clues? All the cards were put on the FRENCH facebook page instead of the appropriate forums, then you do a seperate post spoiling the last figure actually on the forums? I just don't get you guys... You are so scatter-brained. Small reveal of S5 on each forum in their appropriate languge, then radio silence. Then lazy pic dump on French facebook page followed up by ZERO notification on the forums about the lazy pic dump and then more radio silence and then HEY CHECK OUT Missiz Freezz. PS. here's another promo you can only get on ebay cuz screw the USA we here at Ankama hate money but love being unrealiable as hell. 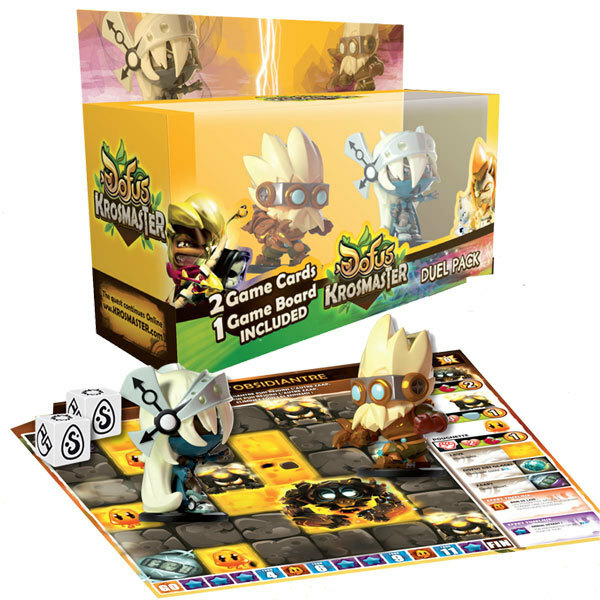 Seriously how did you guys EVER manage to make a quality product like Krosmaster? Typically a business that conducts themselves the way Ankama does is incapable of creating a good product, but the the production value has been great (mostly). But by all rights you guys should have failed miserably and gone out of buisness a loooooong time ago because of the way you conduct yourselves and your buisness. Not just with Krosmaster, all your many, many, many, many endeavors . Tot should write a book. "How to Hit Paydirt with a Shotgun." The Facebook page is available in every language; in fact, we specifically make posts available in English (and Italian, Spanish, German) with all versions of the cards available. If your Facebook account is set in English, you'll see the English posts, and not the French. Shows up as French for me, but upon logging in it changes to English. I discovered this after posting. But in classic Ankara style the EDIT button is broken now so I was not able to change my original post to change the error. The rest is still true. Ankamas haphazard scatter shot marketing posts are all over the place and as unreliable as your support for the game itself. What's more, not only is online run rampant with Julith spam, but now there are players that have discovered some way the cheat because they know no one is watching the servers anymore. I sent you an email on the matter. I think Serenaso is right, you guys just don't care about any fanbase beyond your own home turf. well well well... how did it was...? "the Online Game will be updated in summer"? was it? will it come REALLY soon? Actually, good progress has been made! While I do not have a definite release date, we're getting much closer now. Dewit, it amazes me that given how little you are on here anymore you will still take the time to delete/hide my posts when you don't like the message, but will not take the time to give the English forums the same amount attention as you do your home forum. I was responding to AlexianAnder that I don't think Ankama will EVER get to the update. Understanably I think this because they have abandoned us for over 3 years now with no end in sight. Why would you delete my post responding to his question? Responding with fake information does not a good answer make. Fake info? That's rich. Ok dude whatever you say. Hello, I've noticed on the French site that the competition for Missiz Burnzz's backstory is completed and you've selected a winner. Is there any possibility to translate that story in English for the rest of us lore lovers? I would love to read it.